It’s a magnificent line up of films. There are unique opportunities to see short Scottish films supporting some of the features. Also Eden Court is just a damn spiffing place to be. Two movies today for me. Mike Leigh’s Another Year and Jalmari Helander’s Rare Exports: A Christmas Tale. Slope-headed, knuckle-dragging fan, as I am, of robots that change into vampires and any movie where one character throws cars at another character it is not often that I cross paths with the Mike Leigh oeuvre. My stupid fault. Yes, I am an idiot. The thing is every time I actually see a Mike Leigh film I love it. The problem I have is tricking myself through the door of the cinema in the first place. It’s hard, therefore, for me to rank Another Year against other Leigh films, but what I can say is that on its own merits it is a brilliant piece of work. Will we see a better British film this year? I would guess not. Leigh’s practice of starting without a script but building up the lines through improvised rehearsals sounds risky to me, but it evidently works. Nothing here sounds stilted or forced. The characters, their relationships and they way they talk to each other feels entirely evolved and organic. It was interesting for me to contrast this with last night’s Scottish premiere of Never Let Me Go. The themes of the films are very similar. They each deal with transience, frailty and, ultimately, mortality. But whereas Never Let Me Go (which I think is a fantastic film) makes a virtue of being schematic, elegant and symmetrical Another Year comes across like a chaotic gnarled thing grown out of a particularly fertile soil. Indeed the central couple’s allotment is a fixed reference point throughout the evolution of the story. Another Year is a transfixingly gorgeous mapping of the lives of Tom and Gerri (Jim Broadbent and Ruth Sheen) through four seasons as their friends and relations come and go. The subtlety on display is breath-taking. I kept wondering if some of the dabs of humour were too gaudy, or if some of the depressing declines were too theatrically sad, but no. Everything about the film is perfect. Jim Broadbent is now at whatever stage of sanctity lies beyond “national treasure” and Ruth Sheen is as warm and complex as she was when I first saw her in High Hopes back in 1988. If you have any interest in contemporary British cinema please grab your chance to see this. Another Year was supported by Adam Stafford’s short film The Shutdown. Set in Grangemouth it’s the tale of an incident at the town’s petrochemical plant. It’s based on a short story by Alan Bissett, who also narrates. The detail is convincing. The visuals are hypnotic. 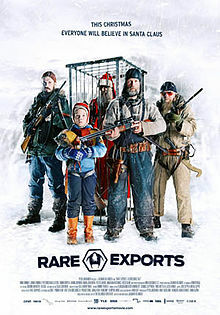 Rare Exports on the other hand is a broad cinematic act of psychotronic Finnish lunacy. A cross between Miracle On 34th Street and 30 Days Of Night for which the world may not quite be ready. On the Finland/Russian border a cull of reindeer fails because something more deadly than the hunters gets to the reindeer first. The hunters blame wolves, agitated by the explosions and drilling coming from the Russian side of the border. Is it wolves, or is it something more sinister? Young Pietari, who knows more about the Russian drilling operation than he should, thinks he knows the truth. The difficulty lies in convincing anyone. I don’t want to give any more detail away as, really, the less you know about the film the better. And I do strongly urge you to see it, particularly if you have a sense of humour that tends towards the dysfunctional. Occupying a point on the festive axis somewhere between A Muppet Christmas Carol and Silent Night, Deadly Night it’s a worthy addition to the elite league of fine Christmas films. Drily witty, but at the same time horrific and ultimately rousing, there isn’t anything else quite like it out there. One note that may count as a possible spoiler: Finnish filmmakers, I have now seen enough scary elf penises and scrotums. Thank you.